← Hey, People: It’s ‘Do Not Go GENTLE Into That Good Night’! Excellent! Boston Gets Wall Street Journal $eal of Approval! Exhibit A: Amy Gamerman’s piece on yesterday’s Wall Street Journal Mansion front page. With poolside cocktails and rooftop mixers, developers aim to lure a younger crowd to a new wave of glassy condos. A digital “Twitter wall” flashes trending neighborhood topics inside the lobby of a new high-rise in the theater district. A freshly built luxury building across town lures affluent young professionals with sunset yoga and hip-hop parties on the pool deck. Downtown, one of San Francisco’s best known restaurateurs, Michael Mina, will craft a new entree every month for residents of a sleek condo tower. And homeowners at a glass skyscraper set to open in 2018 will be able to sip cocktails in private “sky cabanas” overlooking a rooftop pool. They may need to look out the cabanas’ glass walls to remember what city they’re in—Boston. Boston—a city with a Puritan back story and an ingrained suspicion of glitz, where a well-preserved Back Bay townhouse has long been the gold standard of top-tier real estate—is embracing the designer high rise. 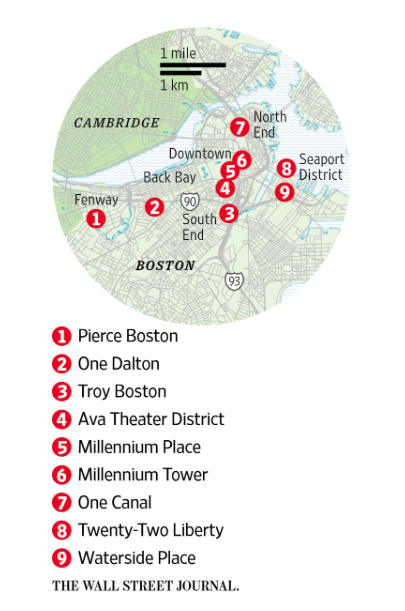 Shiny residential towers are sprouting up across Beantown’s once drab and neglected precincts, emblems of Boston’s boom and its growth as a bigger, more international city. Call the roll of the shiny new objects, compliments of this helpful WSJ graphic. Pop-up Wednesday! Does life get any better than that? Regardless, we’re totally reassessing our grocery-stand produce situation. This entry was posted in Uncategorized and tagged Amy Gamerman, Ava Theater District, Beantown, GE, General Electric, Hubniks, Mansion, Michael Mina, Millennium Place, Millennium Tower, One Canal, One Dalton, Pierce Boston, Troy Boston, Twenty-Two Liberty, Wall Street Journal, Waterside Place, WSJ.. Bookmark the permalink. 5 Responses to Excellent! Boston Gets Wall Street Journal $eal of Approval! The prices have gone up but the names aren’t any better. Back in the “80’s they had names just as good in Allston for a bunch of flim-flam conversions where the biggest construction expense was for a couple bags of black mulch. You’d think these new developers would try harder to distinguish themselves from the ’80’s. Except, now that I think of it, I’m not so sure that some of these new developers aren’t the same people. Waterside Place–they should have left it in the original Algonquin. as a farmer? Folks in fancy condos will pay top dollar for a tomato. As someone who has lived in Boston on and off for over forty years this is sad news. The city is changing beyond recognition, is losing the unique qualities that once made it so special, gave it a unique culture. Is there anyone out there in the media who IS NOT a cheerleader for this new and presumably “better” and “more wonderful” city that is emerging? 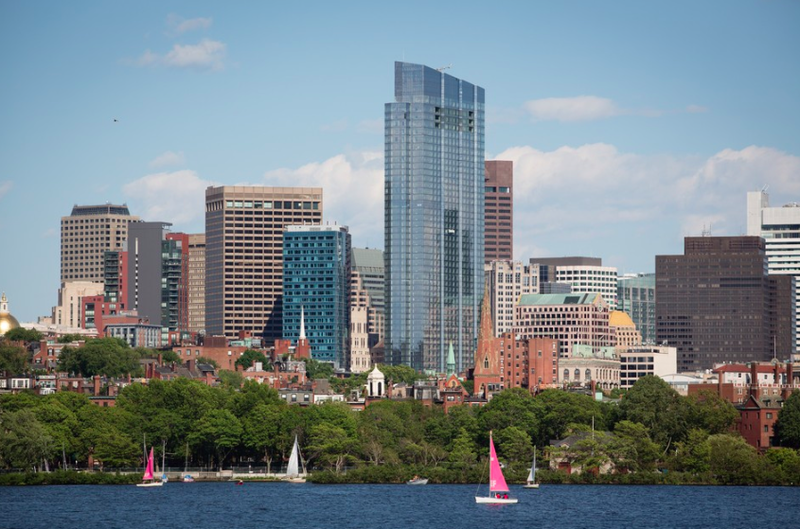 I find the glass towers ugly; while Boston is rapidly becoming unaffordable for people living on modest incomes. Yes, I know this must all sound like nay saying “yada yada”, but there’s more to the issue that what may appear to be one person’s negativity. There’s a lot of history here, too, and there’s been so much razing of older buildings as to nearly erase the city that once was. There’s also something,–to me anyway–dehumanizing about all the go-go change, change without thinking, with the word change used as a kind of synonym for progress; and progress used as a synonym for better, for new and improved. Really? The most difficult part of writing this reply for me is how negative is must read. I write it actually out of love, for the city, one of the few in the country, in which walking to and from work was once a pleasure. Also, a city of bookstores and theaters, many of them small; and of antique stores, neighborhood restaurants and bars. Boston was once a very beautiful, smart, charming and delightful place,–it wasn’t for all tastes, for sure–and now the powers that be are aiming to essentially obliterate the old city in favor of a new one. Alright, a voice in the wilderness here, but this had to be said. I agree with a lot of what you say, telegonus. Boston always seems to want to measure itself against New York, when it really should measure itself against itself. Beyond that, is there any city with fewer bookstores downtown? It’s a scandal – or should be. True, though I suppose the dearth of bookstores,–I was in the business myself in various capacities–is a sign of the times everywhere. Amazon and other Internet sites have picked up the slack; and also, now books are, in effect, “published” on-line. Public libraries appear to be dying out, though their expiration date will be later than it was with bookstores due to their being publicly funded. If you want privacy in a public place go to a library any day of the week or a church on Sunday. It’s Nirvana for introverts. I find it a pity that Boston’s aiming to be “world class” and “international”, fondly remember the provincial backwater it was back in my youth, where bookstores, art house movie theaters and art galleries were everywhere. It was such a funky city, so retro (more often than not) and yet Olympian (I prefer that word to elitist) at times and in places one wouldn’t expect it to be. As to the Boston-New York rivalry, no less a figure than Ralph Waldo Emerson lamented, well over a century ago,–and I’m paraphrasing here–that we’ve become the “urban helotry” of New York, and this was at the beginning of the New England “Indian Summer” Van Wyck Brooks wrote about so many years ago.